if the cotton is to dry you can just get a tooth pick and push it in more. I've purchased a few professionally made founding formicariums online (made for pogos)... My home made set up is most likely the problem. This made me jump! Had my hand too close. if the ants do not move they might be comfortable and the ant setup might not be what is killing them. 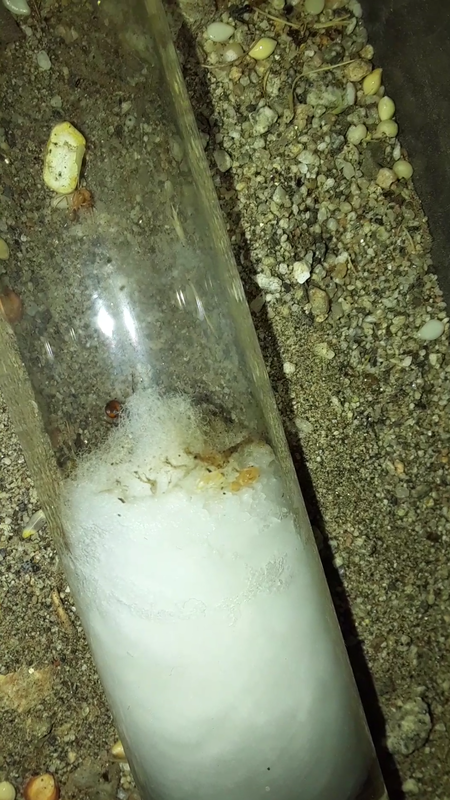 if the ants put seeds in the tubes keep the tubes their that means that the ants have found the tubes and are using it as a storage/garbage site also it is nice to have a back up if the setup actually fails. Well, from what I hear I was lucky to get this far... I just want them to thrive. Moving them will cause some stress... So, I must be careful about this... We will see how the second generation does in this set up.. If, they all survive I might keep them in there for a bit longer. looks like I have some new workers coming soon!! They are looking good today..
OH WOW!! Her first workers are REALLY CUTE! Also, when I went to check on her today she seemed less stressed by the light. Maybe, She feels more confident because she has a worker. I'll post another update in 3 days so we can see how they are doing. Well, that's it for today! OMG today was awesome!!! Here are the pics! I hope you all have a great day! I remember when my Lasius colony got it's first nanitics. (The colony died) I literally freaked out, so I know exactly how you feel. Yeah, I've learned that this stage is very difficult for them to survive through... But, she is still looking good and her two workers will help her raise the next generation. I might have been too quick to blame my set-up...Maybe, she laid too many eggs and could not handle the work load by herself. This new generation looks promising and the brood pile only seems to be growing everyday. Today, I'll count my blessings and hope for the best. They moved the pupae out side of their test tube. Everything seems to be going okay.. I had another worker show up out of no where. So, i'm up to 3 workers now. I haven't lost anymore workers. So, maybe my set up IS working!! 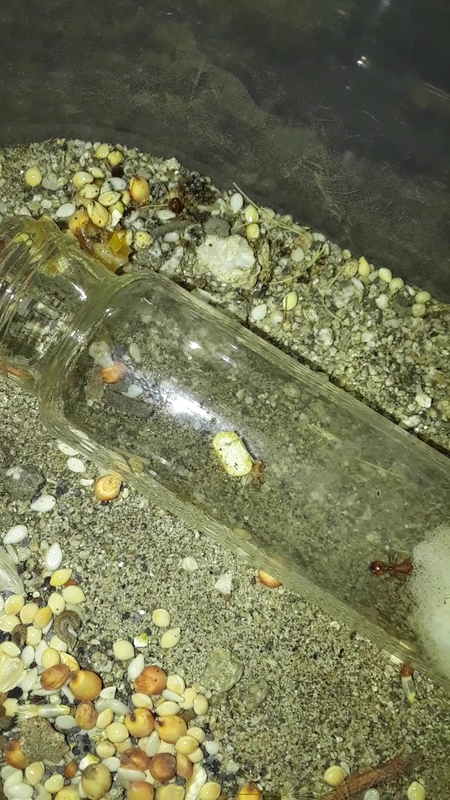 Except, they decided to move the pupae and some of the larvae out side the test tube... not sure if this is bad but I noticed they are moving them as close to the heat as they can get. So, I brought their temp up a bit..